Madeiras is one of the few wines to have changed little since it first became popular over two hundred years ago. This complex family of fortified wines hails from the tiny island of Madeira, Portugal, and is known for its notes of burnt caramel and nuttiness. Born at sea, Madeiras are a rich and exotic wine worthy to be explored. Here’s what you need to know to set sails on your own Madeiras adventure. A versatile fortified wine ranging from dry to sweet. 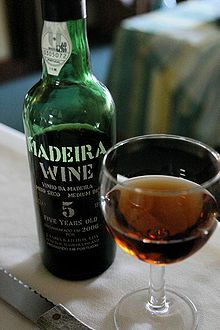 Lower quality Madeiras are usually used for cooking while higher quality or vintage wines are enjoyed as an aperitif or for sipping with deserts. Madeiras drinkers will enjoy notes of caramel, burnt sugar, walnut, peach, orange peel, and hazelnut. Madeira wine ranges 18-20 percent alcohol by volume (ABV). When should I drink Madeira? I just want a cooking spirit, like a cheap port or sherry (and something I can take a nip from in the kitchen). There’s a Madeira for that! Well, kinda. Culinary Madeiras are blended, and therefore not true Madeiras (though they aren’t awful for sipping, especially on a budget!). Cooking-quality Madeiras infuse nuttiness to dishes. These Madeiras are labeled as rainwater, finest, etc., and can be had for under $20 a bottle. I want to serve an exotic wine, but I’m not rolling in dough. Several excellent mid range Madeiras are at your service! Reserve or special reserve Madeiras afford great aperitifs or dessert wines. They’re also the perfect choice for fine cooking. These Madeiras shouldn’t break the bank, especially if you want to make an impression on your guests. Money isn’t an issue. Lay me the deets! A genuine vintage Madeira wine isn’t for the faint of heart. A true, high-quality Madeira can range from $50 to over $10,000 a bottle. Some of these rare vintages are over a hundred years old, and contain a rich flavor profile and unspoken class. But don’t worry. If the $50 bottle of good Madeiras is more you, you’ll probably still wow your guests. 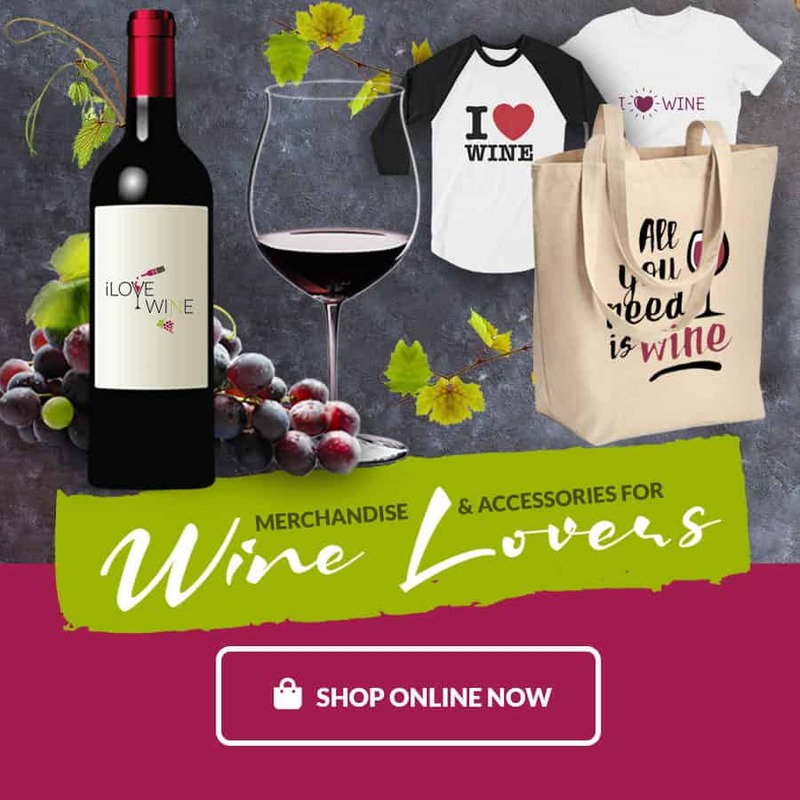 Click here for more on wine styles and flavors. Canteiro: wine aged in barrels in warm wine lodges or in sunlight. Estufagem: wine heated quickly for three months in order to caramelize sugars. Madeiras are rated under two categories, non-vintage and vintage, with sub-levels in each based on quality. Finest (also known as Seleccionado, Choice, Select): aged three years by producer Estufa, typically blended with Tinta Negra. Good for cooking. Reserve (Reserva): aged at least five years. Usually a blend of Tinta Negra. Aged at least five years, making this an excellent cooking wine or aperitif. Special Reserve (Reserva Especial): aged a minimum of 10 years, making this selection excellent for cooking, aperitif, or dessert. Often a single variety made via Canteiro method. Extra Reserve: aged at least 15 years. Usually a single variety produced with Canteiro method. For aperitif or dessert. Colheita (harvest): aged at least five years. Single variety. Excellent aperitif. Frasqueira (Garrafeira): aged 20 or more years with the Canteiro method. Extremely fine aperitif or dessert wine. Solera: no longer produced. Multiple vintage blends using the Canteiro method. First year of the solera is listed on the bottle. 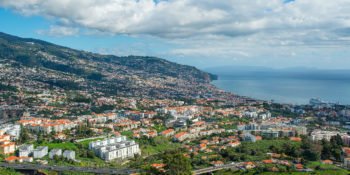 Funchal, the capital city of Madeira. Photo retrieved from Wikipedia. Madeira wine was born on the little island of Madeira, a member of a small archipelago clustered 400 miles off the coast of Morocco. The ancients knew this little archipelago as the Enchanted Isles, particularly Madeira. The beautiful island is lush with vegetation thanks to generous rainfall and a semi-tropical climate. Which begs the question: how on earth did this unlikely place become one of the most esteemed and sought after producers of fine and vintage wines? It was basically by accident. An accident born at sea. The Portuguese settled the isles in 1419. Initially, the sandy soil of Porto Santo held much greater potential for sweet wines than the lushness of nearby Madeira. But the opening of the New World brought unprecedented traffic to the long neglected isle of Madeira. The larger island became a popular port-of-call for ships heading to the New World. Before embarking, sailors stocked their larders with the island’s wines. If not enjoyed immediately, though, the young and unripe wines of Madeira spoiled at sea. Accordingly, wine stocked aboard ships was fortified with sugar spirits, thus bolstering the alcohol content and increasing longevity. Unlike traditional wines, sailors were delighted to find that fortified Madeiras actually got better with the long, balmy journey to and from the tropical waters of the New World. By accident, the world had discovered the perfect recipe for creating an enchantingly complex wine. Born at sea, Madeiras were christened Vinho da Roda, or, wines that made the round trip. Madeira wines saw their golden age in the 18th century. Their popularity spread from the American colonies and Brazil to Northern Africa, Great Britain, and Russia. The American colonies had an outstanding taste for Madeira wines, consuming up to 95 percent of the island’s exports each year. 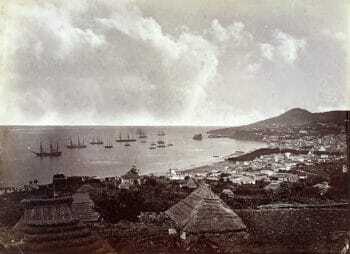 Funchal Bay in 1860. Merchant ships loaded up on Madeiras for the long journey to the Americas and Asia. Photo courtesy of www.madeira-web.com. With months long voyages from Europe to distant lands a thing of the past, the traditional process of aging Madeira wine is long extinct. Instead, the long hot sea voyages are replicated by warming the fortified wine to a toasty 120 degrees F (45 C) for at least three months. Finer Madeiras are aged longer at lower temperatures. The final product is imbued with the caramely tang characteristic of all Madeiras. Today, most exported Madeiras are blended wines. Finer Madeiras are finished by barrel aging alone, sometimes aging for a century or more before bottling. Many commercial Colheita Madeiras are the product of a single year and barrel aged five years. The Tinta Negra variety of grape accounts for roughly 90 percent of all grapes grown on Madeira. Today, most Madeira wines are labeled according to age (3,5, 10, and 15 years) and style (dry, medium, and rich, among others). If it is not labeled as being made with traditional grape variety (the “noble grapes”) it is to be understood they are of the Tinta Negra variety. Madeiras created with traditional grape varieties are labeled as such. And of course, they’re more expensive. 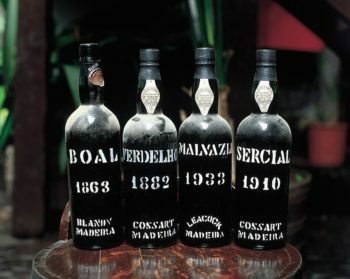 The four vintage Madeira varieties. Image courtesy of www.madeira-web.com. Vintage Madeiras must be of a single year and traditional grape variety and aged at least 20 years. Vintage Madeiras are a timeless libation, seemingly untouchable from the decay of time. Madeiras as a whole are invariably better with age, and an opened bottle of any good vintage retains freshness for months and even years. Besides filling the cups of statesmen and patriots (and lowering their inhibitions), Madeiras played a roll in bringing about the American Revolution. In 1768, riots broke out in Boston after 3,150 gallons of John Hancock’s Madeiras were confiscated from a ship. Madeira wine was a favorite of Thomas Jefferson, George Washington, Alexander Hamilton, Benjamin Franklin, and John Adams. Not surprisingly, it was used to toast the signing of the Declaration of Independence. The end of an era for Madeira … or was it? The booming Madeiras business was significantly slowed in the mid 19th century by fungal epidemics that killed traditional grape varieties. The industry was almost killed by the simultaneous events of the Russian Revolution (1917) and the American Prohibition (1920). By the end of Prohibition, the global export of Madeiras was almost non-existent. In 1988, Madeiras were resurrected by a wealthy Portuguese family, who invested heavily in creating a market for Madeiras in America.